The fall garden in the Mattole is really where it's at. All you Central Valley peeps have your tomatoes in June, and all you Calistoga folks have your corn seven feet tall by 4th of July, but on the coast, here in the Mattole hole, we have the September/October garden peak. I tend to forget this, when nothing is ready by our Leo Party in August, when my aunt asks me what is ready. Usually only cucumbers. And she doesn't like them. 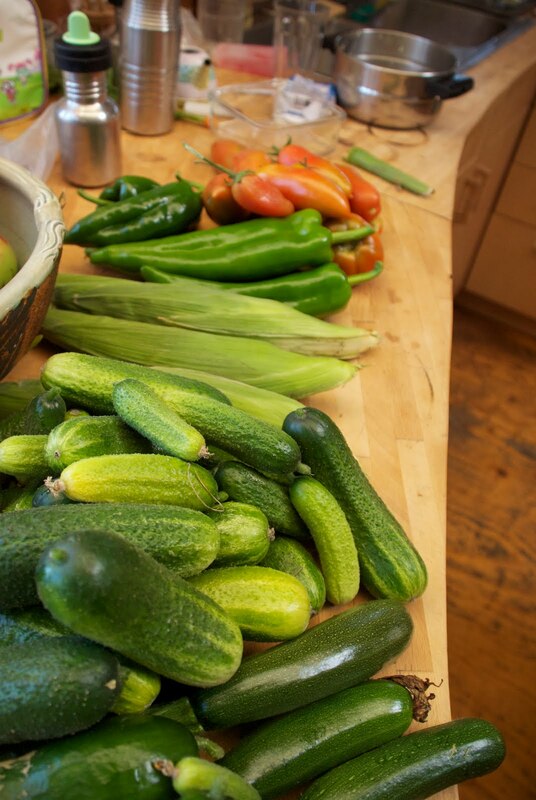 But once things fully dry out in the indian summer, and the sun is low and hot, we start our tomato pump, and the zucchini ride, and the corn is happening too fast to eat it all, and we STILL have cucumbers. And the winter squash is almost done, and the raspberries and strawberries are still happening, the green beans are still giving 4-5 pounds every three days, and the eggplant has at last begun to make fruit, and the peppers are even turning red, THEN I remember why I labor over those little seeds in flat, struggling to keep them warm in March, when they really should be snug in their seed packets in the shed. All that, and we already have some of our winter crops, like carrots and beets. It's really a tremendous feeling of abundance to have all this food coming steady out of the garden. We've got extra people here, and we are not short on veggies. I don't really need to buy anything at the store but avocados, lettuce, and cabbage. And we'll have some of our own here soon. And did I mention the egg machine? If you want eggs all winter, it's imperative to have April chicks, because they will lay eggs through their first winter. At the last minute this year, I bought 12 more laying hen chicks one April day when I was in town. Barred Rock beauties. We've been seeing a few pullet eggs here and there for a few weeks, but two days ago, we suddenly came in with 16 eggs in one day. Usually, we get 7-9. But now we have overlap, the new girls are all beginning to lay, and the old gals haven't quit for the winter yet. Hello, souffle! Mix together in a bowl, and enjoy heartily, around a table filled with family and friends. There really is a lot of latitude with this recipe, I make it a little differently every time, and the quantities of dressing are VERY inexact. Do what tastes right to you, the basic flavors carry through. Bon appetit!